Ceiling damage as the result of water intrusion through the roof of this home. 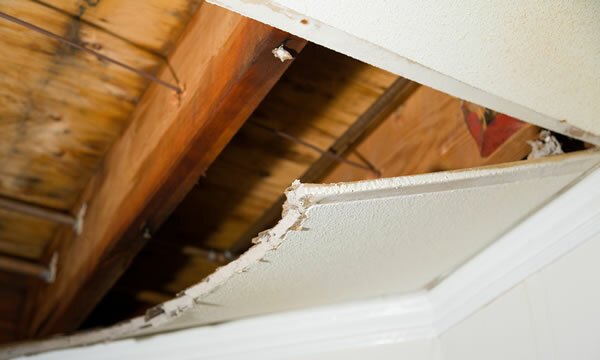 Water damage is extremely destructive to a home or building. Water damage can occur from a broken pipe, an appliance that has malfunctioned, seasonal flooding, even from putting out a house fire. Sometimes water damage can occur from storm drain or sewage backup, the latter which is often hazardous to your families health. Hubble Construction and Restoration specializes in water damage repairs. We can come and quickly assess the damage and take any immediate precautions that might be required. After the damage has been contained, we can assist with the rebuilding and restoration process. If your water damage problem was caused by raw sewage then it’s a guarantee that the disaster area contains bacteria, and possibly other blood born pathogens and organisms that hazardous to your families health. These can be transmitted by simply touching some of the contaminated materials or by unknowingly tracking them into uncontaminated areas. Hubble Construction and Restoration staff are properly trained to handle the risks of working around raw sewage and other hazardous situations that may arise from a problem of this nature. When the Hubble crew has completely removed all of the water damaged contents from your building, we’ll then begin the drying process. We have several different options available to us when it comes to drying out the structure. Each method involves lots of air movement which is the most critical part of the drying process. Moisture left behind can quickly lead to mold and even bigger problems. Our technicians are properly trained to tackle these situations that will arise around water damage claims. Mold, Mildew and Raw Sewage can all contribute to unpleasant odors left behind after a water damage disaster in your home or building. Hubble’s qualified cleaners use the latest methods and equipment to kill odors at the microbial level. Using our equipment and specialty purposed industry cleaners we can eradicate and eliminate the odors in your home after a water damage claim. We aren’t just in the Construction business. We’re a family run business that helps out other families when they’ve been struck with a disaster in their home. Maybe you had a sewage backup problem, or a broken water pipe under the kitchen sink. Whatever the size and scope of your water damage problem Hubble Construction and Restoration is large enough to handle your project and we’re still small enough to offer you that personalized service you’d expect when it comes to your home. Tip: If you suspect that you may have water damage in your home such as a slow pipe leak, or a leaky roof or some other water intrusion issue you NEED to have it looked at immediately. Moisture leads to Mold and many insurance companies will refuse coverage if your water damage claim has progressed to mold damage.